Whether we’re taking a luxurious bath or just getting ready for the day, we all spend a lot of time in the bathroom. Taking the time and money to redo this room will, inevitably, pay off if you choose to live in your home for five years or more. If you’re thinking of selling your house, there are better investments to maximize the value of your home. However, making your bathroom more pleasant for you and your family will be well worth it. Here are 3 ideas to get you thinking. For a relaxing bath, you need a few things. Some pleasant scents, quality soaps and shampoos, and candles are a simple way to create a spa experience, but the best way to create relaxing soak is to invest in a new bathtub. Now, there are a ton of different options for a new bathtub including freestanding and integrated models. Some bathtubs also have added features like jets or a seat. You also have options for the material that your bathtub is made of. Porcelain, though more traditional, may not be as easy to maintain as something more modern, like acrylic. 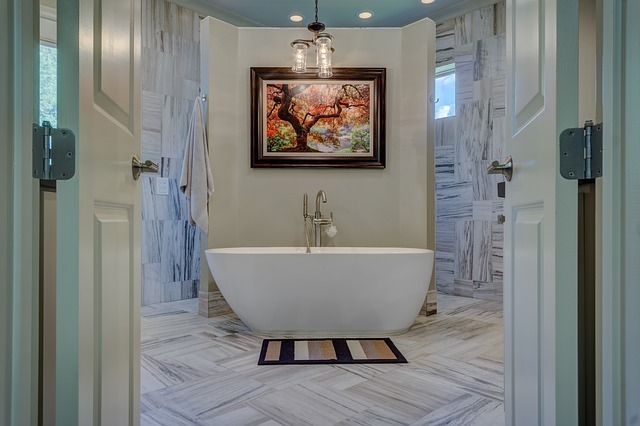 No matter what kind of bathtub you choose to invest in, make sure that you start with this feature, as it will likely affect your overall budget. Though buying a new bathtub may be obvious, investing in ample storage options is just as essential for your bathroom remodeling project. You’ll need space for your bathing products, towels, cleaning supplies, and other essentials that you use in your bathroom. The key with good storage is that you can keep everything you need in the room without it looking cluttered, so keep that in mind. Good lighting can change the tone of a room like you wouldn’t believe, so don’t forget to think through it when you’re planning out your new space. Though you will certainly want an overhead light, you should also consider vanity lighting near your mirrors so that you can get a good look at what you’re doing, and lamps for when you’re trying to relax. A harsh, white overhead light is not your only option and frankly, it’s hard to let the stresses of the day go with it bearing down on you. Whether you’re looking to redo your bathroom yourself or you’re looking to hire a contractor, we have everything you need to make your house into your dream home. Contact us today for more information on how we can help you or stop in and take a look! We’d love to see you. This entry was posted on Sunday, April 14th, 2019 at 5:40 pm. Both comments and pings are currently closed.